When you hear “mother-daughter getaway,” military fortifications are likely not the first thing that come to mind (despite the delicate and sometimes volatile nature of these relationships). After a day of shopping and admiring the charming squares in Savannah, making special note of Chippewa Square where Forrest Gump quoted his momma’s famous line – life is like a box of chocolates, you never know what you’re gonna get – my mom and I ventured 15 miles east of town to check out Fort Pulaski National Monument. We are by no means history buffs, but curious by nature, and we have discovered that national parks are the best places to learn about our country. It was a pleasant, short drive from Savannah on a road adjacent to scenic wetlands. We timed our arrival to the park’s opening so we could explore the visitor center before touring the fort with a ranger and seeing a musket demonstration. Lush, expansive lawns carpet the area around the fort, and palm trees were welcome reminders of our hospitable locale. We enjoyed walking the North Pier Trail through woods that created an arbor-like cover. Upon exiting the trees, the remains of Battery Hambright, built during the Spanish-American War, beckoned us to explore and to imagine the soldiers who climbed its stairs many years ago. As we walked along the old north pier, tiny crabs scattered here and there making the ground dance. The salt marshes and peaceful cadence of the Savannah River made me wish I had a kayak, and I forgot for a moment that we were at a park focused primarily on history. We took a break to enjoy the view and to refuel with chocolate-covered pretzels and apples, because my mom, like most, still always packs snacks. The exhibits and movie in the visitor center gave great background information on the fort’s 150-year history, and we were eager to learn more. The fort and its moat (sometimes enjoyed by alligators), were visually interesting and surprisingly handsome. A drawbridge and earthworks guided us to the parade grounds where fellow visitors gathered for the tour. 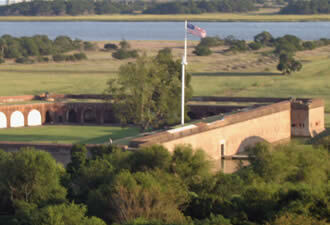 The ranger told us about the fort’s history and architecture – Fort Pulaski is one of the best preserved forts in the defense system known as the “Third System” – and about the people who worked, lived, and died here. We cringed at the conditions and the plight of Confederate prisoners of war known as The Immortal Six Hundred. 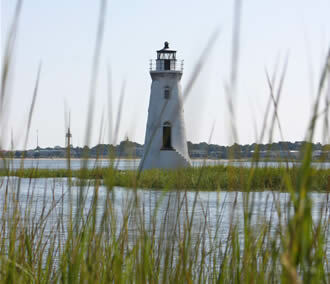 From the top of the fort, expansive views of the river, beautiful Cockspur Island, and its quaint lighthouse, distracted the mind from the area’s history of battle and sacrifice. Bang! Back to reality and the musket demonstration. 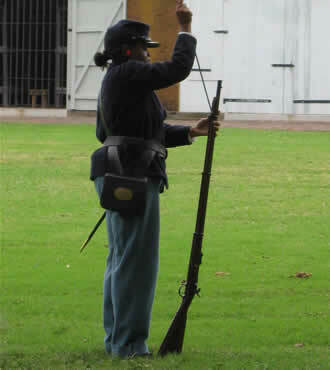 Obviously a popular activity, the ranger in Civil War uniform drew a crowd of people of all ages to watch her fire a musket. This was a highlight of our visit – the ranger was knowledgeable and infectiously enthusiastic about her job. Mom and I poked around the bookstore and gift shop and stamped our national park Passport books before heading back to Savannah. On the way home, I asked my mom what was her favorite part of our trip to Savannah. She said, without hesitation, “I really, really enjoyed Fort Pulaski.” So, there you have it, life is like a box of chocolates, and our visit to Fort Pulaski was truly lucky – like picking the piece with your most favorite, gooey candy center. by Jennifer Mummart, National Park Service, Washington, D.C.